Transit TV. Photo by sgroi via Flickr. Love it or hate it – and according to Metro surveys, most customers prefer it – Transit TV is back, under new ownership and ready to give bus riders something entertaining and informative to occupy their time. Transit TV is now owned and operated by TEZO Systems, a locally based company that specializes in GPS based advertising. Like all television, Transit TV funds its programming by advertising, and TEZO Systems unique and affordable “Geo-Ads” targeted advertising aims to link local small businesses with bus riders. Here’s how it works: advertisers pay a nominal daily fee (as low as $.99) based on ridership and as the bus approaches the advertised business along the route a banner ad pops up on the Transit TV display for 30 seconds. Advertisers are also given a Transit TV email address that riders can email from their mobile devices for electronic coupons. This super targeted advertising not only helps local business attract nearby customers, but it lets riders know what’s along their route – something I think is pretty cool. Along with the new advertising system comes fresh programming, including national news from the Associated Press and local news in both English and Spanish from NBC and Telemundo. There’s also programming specifically aimed at Metro riders that inform riders of various Metro accessible destinations in L.A. No word on if the “Kitchen Cut-ups” are back for another season (let’s hope not). In case you were wondering, Transit TV costs Metro nothing and does in fact generate some advertising revenue for the agency. And considering Metro’s current financial crisis, every little bit of revenue helps. Transit TV is under new ownership, broadcasting on video monitors on Metro buses throughout Los Angeles County with new programs and features to entertain riders. The redesigned service includes news and weather updates from the Associated Press (sometimes anchored by actual Metro customers), as well as local reports in English and Spanish from NBC and Telemundo. Other new features include interactive word games, trivia questions and essay and art contests for which passengers can win prizes. Transit TV also broadcasts entertaining, informative segments called “Metro Destinations” that acquaint riders with different Los Angeles-area attractions accessible by Metro. Riders learn about specific travel itineraries to East Los Angeles, Hollywood/Highland, Pasadena, Universal City, Long Beach and more. Owned and operated by TEZO Systems, Transit TV plans to offer Metro riders a new “L.A. identity” based on programming that highlights local travel, restaurant and entertainment tips, local music and educational health segments. In a unique use of GPS technology, the Transit TV system has the capability to flash banner ads for local businesses onboard Metro buses as the bus approches their location. Transit TV has developed a website where vendors can go to create and purchase their banner ads, and where they can offer riders electronic coupons. The cost of such advertising can be as low as $.99 per day. For advertising opportunities call (818) 768-0617 or visit http://geoads.transit-tv.com. Transit TV is well received by Metro riders. In customer surveys, more than 84 percent of riders say they prefer being on a bus with the monitors. 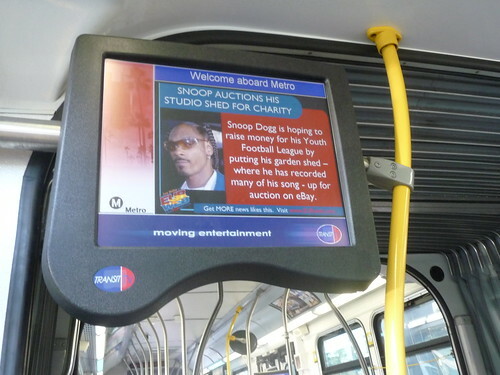 Fresh television content in both English and Spanish is produced and delivered wirelessly to METRO buses once a day. To plan your next trip on Metro bus or rail, use the Metro Trip Planner at metro.net or call 1-800-COMMUTE.